We hung out at Hand and Lock tonight, the 250-year-old embroidery house who work with everyone from Louis Vuitton to the royal family. 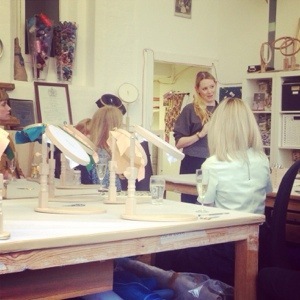 It was a collaboration with Pinterest UK and Mastered and the studio was full of bloggers, journalists and super pinners (aka the Pinterati, apparently) learning how to do goldwork embroidery. I tried: goldwork embroidery for the first time. I rather like it. I met: Hand and Lock’s head of design, Scott Heron, who was wearing a fabulous oversized white shirt and beautiful eyeliner. I learnt: There’s a reason why couture dresses like this are so expensive – it takes a bloody long time to do. so jealous. Hand & Lock are incredible. London’s only ‘petits mains’. you are so lucky! Sounds a lovely night! I love gold work, yes it takes ages but so worth it!